Water Chemistry Slightly acid to around neutral. Substrate Plain gravel or sand, but will benefit from nutrient substrate. 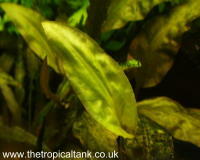 Comments One of the easier Cryptocoryne to cultivate.